Concerned that the time for its extra intrusiveness has passed, civil libertarians are calling for some provisions of the Patriot Act to be rolled back. America has a long — and at times embarrassing — history of curbing civil liberties in times of perceived peril. There were the Alien and Sedition Acts of the late 1700s, authorizing the deportation of immigrants and restricting the free speech of government critics during wartime. Later, there came the internment of Japanese-Americans during World War II, the investigation of citizens suspected of sympathizing with communism during the Cold War and the surveillance of antiwar activists during the Vietnam era. "In each of these cases," said Julian Sanchez, a researcher at the libertarian Cato Institute, "we can also take some heart that we&apos;ve shown a consistent pattern of holding in such high esteem the individual liberties that have made the basis of the republic — that the powers lent to the government in moments of fear are typically rolled back." And then there is the War or Terror, which is a slightly different story. World War II eventually ended, as did America&apos;s undeclared war with the French in the 1700s. But the current conflict appears as amorphous and open-ended as its beginning was clearly defined. And if it&apos;s not obvious when the threat has passed — and clearly, the government doesn&apos;t believe it passed with the death of Osama bin Laden three weeks ago — how will we know when it&apos;s time to roll back law enforcement provisions that infringe on civil liberties? Bin Laden&apos;s death invites the question. But so, too, does an upcoming deadline Sanchez has been eyeing — several controversial provisions of the nearly decade-old Patriot Act are about to expire. In the next few weeks, Congress will have to decide whether or not to extend tools first granted to the government in the frightening aftermath of Sept. 11, renewing a now-perennial debate about how many and which liberties we&apos;re willing to fudge in the name of national security. Sanchez has just published a policy analysis of the provisions on the table, in which he recommends eliminating one altogether and dramatically narrowing two others. On Monday, he made that case to congressional staffers on Capitol Hill, where political fears of appearing "soft" on terror have often overridden sober consideration of constitutional constraints. 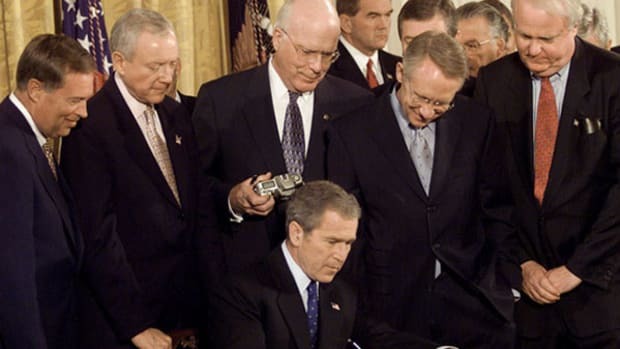 Congress has made permanent many of the provisions of the Patriot Act (which was hastily passed in October of 2001 over the admitted confusion of many members of Congress). The three particularly contentious pieces in question now, however, could still sunset. They include the "lone wolf" provision permitting the government to monitor individuals unconnected to any terrorism group or foreign power — a tool the Justice Department says it has never used. Also at stake are "roving wiretaps," which enable the government to follow individuals even as they change cell phone numbers or email accounts (you know what investigators are getting at here, Sanchez says, if you&apos;ve ever watched The Wire). The third provision dramatically expands the scope of records investigators may demand. Sanchez and other civil liberties groups are also particularly concerned with the FBI&apos;s power to issue "national security letters," which permit the collection of many personal records without prior court approval. The statute authorizing national security letters isn&apos;t among those expiring, although critics of the sweeping power argue that now is the time to re-examine it, amid public debate of the other surveillance tactics. The Justice Department just revealed two weeks ago that it has dramatically increased its use of national security letters, to more than 24,000 in 2010 from 14,000 the previous year. Those numbers are part of a broader trend suggesting many of these tools are being used now more than ever. "We see this steep rise with really no explanation," said Michael German, policy counsel for the American Civil Liberties Union and a former FBI agent. "There&apos;s still very little that we know about how these authorities are actually being used. And as we talk about extending them, or perhaps even taking them further, that should be something that scares all of us." Many of these tools particularly concern Sanchez because they lead to the overcollection of data, ensnaring individuals not legitimately tied to government investigations. That data, no matter how irrelevant, is then retained by the government indefinitely. Technological trends, meanwhile, have enhanced the power of the Patriot Act over the past decade in ways its original authors may never have even envisioned. Individuals who might have previously kept records on a personal hard drive, for example, are now more susceptible to having that information monitored online — or collected from a third party, such as a web server, without the individual&apos;s knowledge. "Modern technology has made these records vastly more revealing," Sanchez added. Meta-data about what listserves you&apos;re on, who you Gchat with or what phones numbers you regularly dial can tell investigators much now about who you associate with, where you are and what you&apos;re doing. "We need to recognize that once that information is locked into a database," Sanchez said, "we don&apos;t have any guarantee of how, a year from now or 10 years from now, that data will be used in ways that well-intentioned people now did not intend or anticipate." While U.S. Rep. Peter King holds hearings on the threat of homegrown Islamic terrorism, those who actually look at the issue say the incidence is small and dropped last year. Remember When the Patriot Act Debate Was All About Library Records? The early debate around a key provision wasn’t about anything like mass collection of phone records. The proposed DREAM Act’s effort to allow the foreign-born children of parents who entered the U.S. illegally fights the headwinds of the immigration debate. The case of Colombian journalist Hollman Morris, refused entry to the U.S. for a prestigious fellowship, suggests reporting on terrorists may be confused with being one. To create goodwill, USAID proposes using American money overseas for religious structures. But will that upset our foundation of church-state separation?